C. Michael Ferraro, president/CEO of TRAINING SOLUTIONS, Inc., has addressed a wide range of topics before a variety of audiences. His areas of specialty for presentations include Publicly Funded Workforce System, Workforce Investment Act, Workforce Readiness, Sales, Leadership and Teambuilding. 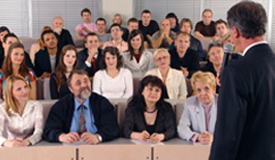 Other TSI team members are available to present on topics including career development, sales and leadership.